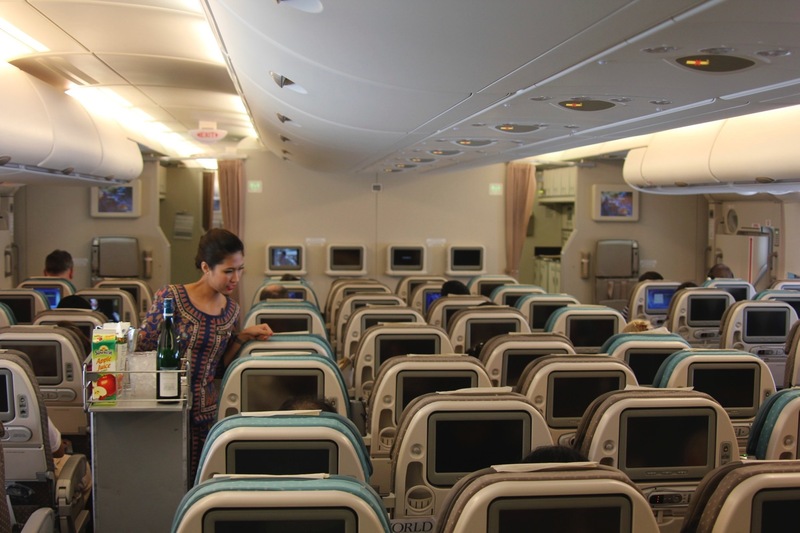 It was with some reluctance that I agreed to fly Singapore Airlines economy class, but it was not a mistake: the flight turned out to be one of the best economy class experiences in all my years of flying. I outlined here what a great deal a walk-up ticket on Singapore Airlines is for travel from New York to Frankfurt. Due to a lack of award space availability and a need to be in Frankfurt the following day, John and I booked a “walk-up” ticket on Singapore’s daily Fifth Freedom flight from JFK to FRA. We wisely left the Park Hyatt at 4:15pm, four hours before flight takeoff. The hotel offers complimentary black sedan service in the near vicinity of the hotel and so we were driven to Penn Station to catch a LIRR train to JFK/Jamaica. Even that was a mistake…traffic was so bad we should have just walked to the E train subway from the hotel and taken that. Upon arrival at JFK, we checked-in in the business class line due to my Star Alliance Gold status. Many of the seats were blocked, including all bulkheads, and the agent said they would remain blocked until a gate agent released them just prior to boarding. Hoping to secure bulkheads, we accepted the only two seats available…in the last row of the aircraft. As I previously detailed, we ran into a horrific security line at JFK. It took 80 minutes in the priority security line (which I used because John did not have PreCheck yet [but does now]). Even the Pre-Check line was horrible. After finally making it past the security checkpoint, we only had a short time before boarding began. We checked out the SWISS Business Class lounge, which was so crowded I did not bother taking any pictures. You can read an old review of the lounge here. At the gate, I asked an agent if any bulkhead seating was available and John and I were given our own bulkhead section of four in the rear economy class cabin. Boarding had already began. Onboard, a lovely Singapore girl warmly welcomed us, inspected our boarding passes, and directed us to our seat in the rear of the aircraft. Singapore has two A380 configurations. On our aircraft, first class and economy class seating were on the lower deck, while upstairs was all business class. The alternate configuration features a small economy class cabin in the rear of the upper deck. The seat was well paced and with a 32″ seat pitch, legroom is generous. What impressed me more than the above-average economy class seat, was the bedding. Both the pillow and blanket are literally better than what some airlines offer in business class. Prior to takeoff, FAs offered amenity kits to every economy class passenger. These featured socks, a toothbrush, and toothpaste. While very simple, the added touch was quite appreciated. Singapore’s KrisWorld entertainment system offers an exceptional selection of hundreds of movies, TV shows, games, and musical selections. I was impressed at the depth of the selection and choice of moves available from all regions of the world. Relatively decent disposable headsets were present in each seat-back. That said, I spent most of the flight working and did not actually watch anything. I also did not use the Wi-Fi, because prices are outrageous…see here. The lavatory I used was not exactly spacious, but FAs routinely cleaned it…something that greatly distinguishes airlines like Singapore from their U.S. counterparts. It is nice to walk into a clean lavatory toward the end of the flight. Hot towels were also offered twice in-flight. And note these were not just warmed paper towels, but towels far better than American and Delta offer in business class. The economy class menu even features a selection of complimentary cocktails. Being Singapore Airlines, I could not resits a Singapore Sling. My selection, cajun chicken in oregano tomato sauce was excellent. Truly delicious. I cannot say the same for the bread or coleslaw with processed ham on time. Then Häagen-Dazs ice cream for dessert with coffee/tea service. Prior to landing, a light meal was offered. I was hoping for an egg dish of some kind, but it was just a cold ham and cheese sandwich (the other choice was a smoked salmon sandwich). It was not worth eating, but I enjoyed the fruit and a cup of green tea. Perhaps the best part of the flight was the tremendously gracious service onboard. John can be demanding and seemed to forget that he was not flying first class. He frequently rang the FA call button and each time FAs promptly responded. An extra blanket? No problem. Bottle of water? Of course. Second ice cream? My pleasure. Tea before dinner? Certainly sir. And while they may have cursed him out in the galley, it certainly did not show. In fact, this sort of service was given to every passenger. And I appreciated it. We landed in Frankfurt over an hour early…flight time ended up being only about six hours. It was a great flight and even John walked away saying, “You know, this was a very good flight. I’m very impressed by Singapore Airlines.” If the man who generally only flies first class bestowed that accolade, you know you must be doing something right. As Singapore continues to lose money on its longhaul flying, I hope that it will not address the issue by cutting back economy class service. What Singapore offers is truly an industry-leading economy class experience. @Matthew – Great review. I will be flying this route in the near future. What’s the best way to grab those bulkhead seats? Should I pre-select seats and then ask check-in agent and/or gate agent the day of or should I not select seats beforehand and do what you outlined above? Thanks. Thanks Jamie! I did not pre-assign a seat because I did a same-day booking, but I would still pre-assign seat in your case. Get the best you can now and hope that you can improve it at the airport. I doubt cuts are in SQ’s minds as they are one of the only4 airlines in the world that operates both a long haul LCC and a premium service carrier. Only LH, QF and IAG operates as such. Their budget arm Scoot is making tons of money and rather than tarnishing it’s own reputation by downgrading it’s on board product on SQ they will just transfer unprofitable routes to Scoot which flies the 788 and 789. They have already done it to Athens and Honolulu from Singapore. Remember SQ was one of the first to say no to 10 abreast on the 777. NO APOSTROPHE FOR POSSESSIVES. Sheesh. Your travel partner John sounds like a nightmare. Using that call button for tea, ice cream, etc? I wouldn’t have the nerve. Those poor FA’s have better things to do than be his personal servant. You should have said something to him. Reading this review, I think you may be pleasantly surprised with long-haul economy class on…..wait for it……Saudia! They share a few things with Singapore, including the amenity kits, silverware and menus. Not to mention the seats which were voted best economy seats a few years ago on Skytrax. Maybe try one of their flights to/from North America, which happen to have their best hard products. Hi Aziz, I have flown SAUDIA long haul economy class before (JFK-JED-JFK). If you search the blog you’ll find my trip reports. A very good experience indeed. I enjoy your Y reviews even more than C or F. Maybe it’s just because my odds for similar experience are much better than premium cabins, but it still takes much more effort to write an interesting piece on economy, which is basically about getting you from point A to B with nothing extraordinary (no seats that recline only about 170 degrees or lukewarm nuts to complain about). I appreciate how you can enjoy coach, the everyday way of travel for most of us, after flying some top-notch products. Thank Jimmy. I truly did enjoy this flight. Singapore truly impressed me. Great review Matthew. I think it is great you still fly economy sometimes while many other travel bloggers don’t. Your passion for flying, regardless of where you are sat in the plane shows! Great Review! I love Singapore Airlines. I recently had a fabulous experience on Etihad, where the service was comparable to Singapore but not as attentive as Singapore. I will be flying Air France A380 out of JFK. Have you flown with them? Have not flown Air France. Look forward to hearing about how you liked it. Great report! How do you find the legroom at the bulkhead? I usually steer clear of the bulkhead because it often disappoints with no room to really stretch your legs and the reduced seat width. Your legs are ultimately restrained, but I loved not having anyone recline in my face. Thanks for commenting. I trust you will enjoy your trip! Now looking forward to our flight from LHR to SYD with SQ in a few weeks. We are travelling with a 8month old and so will be sitting at bulkhead, can you tell me if the bulk head seats in economy have an AC outlet? Thanks again for the great review. There are outlets under the seat. Enjoy your trip! Photos inside the cabin are not very impressed me. If someone flew with the China Airlines from New York to Taiwan, they will confirm how much better the aircraft looks like than Singapore Air. ( I am now about the economy class). Well, the service on the China Airlines is exactly the same as Singapore Air. We were very pleasantly surprised.